"ISP" redirects here. For other uses, see ISP (disambiguation). "Internet service" redirects here. It is not to be confused with Web service. The Internet (originally ARPAnet) was developed as a network between government research laboratories and participating departments of universities. Other companies and organizations joined by direct connection to the backbone, or by arrangements through other connected companies, sometime using dialup tools such as UUCP. By the late 1980s, a process was set in place towards public, commercial use of the Internet. The remaining restrictions were removed by 1991, shortly after the introduction of the World Wide Web. During the 1980s, online service providers such as CompuServe and America On Line (AOL) began to offer limited capabilities to access the Internet, such as e-mail interchange, but full access to the Internet was not readily available to the general public. In 1989, the first Internet service providers, companies offering the public direct access to the Internet for a monthly fee, were established in Australia and the United States. In Brookline, Massachusetts, The World became the first commercial ISP in the US. Its first customer was served in November 1989. These companies generally offered dial-up connections, using the public telephone network to provide last-mile connections to their customers. The barriers to entry for dial-up ISPs were low and many providers emerged. However, cable television companies and the telephone carriers already had wired connections to their customers and could offer Internet connections at much higher speeds than dial-up using broadband technology such as cable modems and digital subscriber line (DSL). As a result, these companies often became the dominant ISPs in their service areas, and what was once a highly competitive ISP market became effectively a monopoly or duopoly in countries with a commercial telecommunications market, such as the United States. On 23 April 2014, the U.S. Federal Communications Commission (FCC) was reported to be considering a new rule that will permit ISPs to offer content providers a faster track to send content, thus reversing their earlier net neutrality position. A possible solution to net neutrality concerns may be municipal broadband, according to Professor Susan Crawford, a legal and technology expert at Harvard Law School. On 15 May 2014, the FCC decided to consider two options regarding Internet services: first, permit fast and slow broadband lanes, thereby compromising net neutrality; and second, reclassify broadband as a telecommunication service, thereby preserving net neutrality. On 10 November 2014, President Barack Obama recommended that the FCC reclassify broadband Internet service as a telecommunications service in order to preserve net neutrality. On 16 January 2015, Republicans presented legislation, in the form of a U.S. Congress H.R. discussion draft bill, that makes concessions to net neutrality but prohibits the FCC from accomplishing the goal or enacting any further regulation affecting Internet service providers. On 31 January 2015, AP News reported that the FCC will present the notion of applying ("with some caveats") Title II (common carrier) of the Communications Act of 1934 to the Internet in a vote expected on 26 February 2015. Adoption of this notion would reclassify Internet service from one of information to one of the telecommunications and, according to Tom Wheeler, chairman of the FCC, ensure net neutrality. The FCC is expected to enforce net neutrality in its vote, according to The New York Times. On 26 February 2015, the FCC ruled in favor of net neutrality by adopting Title II (common carrier) of the Communications Act of 1934 and Section 706 in the Telecommunications Act of 1996 to the Internet. The FCC Chairman, Tom Wheeler, commented, "This is no more a plan to regulate the Internet than the First Amendment is a plan to regulate free speech. They both stand for the same concept." On 12 March 2015, the FCC released the specific details of the net neutrality rules. On 13 April 2015, the FCC published the final rule on its new "Net Neutrality" regulations. These rules went into effect on 12 June 2015. Upon becoming FCC chairman in April 2017, Ajit Pai proposed an end to net neutrality, awaiting votes from the commission. On 21 November 2017, Pai announced that a vote will be held by FCC members on 14 December on whether to repeal the policy. On 11 June 2018, the repeal of the FCC's network neutrality rules took effect. Access provider ISPs provide Internet access, employing a range of technologies to connect users to their network. Available technologies have ranged from computer modems with acoustic couplers to telephone lines, to television cable (CATV), Wi-Fi, and fiber optics. For users and small businesses, traditional options include copper wires to provide dial-up, DSL, typically asymmetric digital subscriber line (ADSL), cable modem or Integrated Services Digital Network (ISDN) (typically basic rate interface). Using fiber-optics to end users is called Fiber To The Home or similar names. For customers with more demanding requirements (such as medium-to-large businesses, or other ISPs) can use higher-speed DSL (such as single-pair high-speed digital subscriber line), Ethernet, metropolitan Ethernet, gigabit Ethernet, Frame Relay, ISDN Primary Rate Interface, ATM (Asynchronous Transfer Mode) and synchronous optical networking (SONET). Wireless access is another option, including cellular and satellite Internet access. A mailbox provider is an organization that provides services for hosting electronic mail domains with access to storage for mail boxes. It provides email servers to send, receive, accept, and store email for end users or other organizations. Many mailbox providers are also access providers, while others are not (e.g., Gmail, Yahoo! Mail, Outlook.com, AOL Mail, Po box). The definition given in RFC 6650 covers email hosting services, as well as the relevant department of companies, universities, organizations, groups, and individuals that manage their mail servers themselves. The task is typically accomplished by implementing Simple Mail Transfer Protocol (SMTP) and possibly providing access to messages through Internet Message Access Protocol (IMAP), the Post Office Protocol, Webmail, or a proprietary protocol. Internet hosting services provide email, web-hosting, or online storage services. Other services include virtual server, cloud services, or physical server operation. Just as their customers pay them for Internet access, ISPs themselves pay upstream ISPs for Internet access. An upstream ISP usually has a larger network than the contracting ISP or is able to provide the contracting ISP with access to parts of the Internet the contracting ISP by itself has no access to. In the simplest case, a single connection is established to an upstream ISP and is used to transmit data to or from areas of the Internet beyond the home network; this mode of interconnection is often cascaded multiple times until reaching a tier 1 carrier. In reality, the situation is often more complex. ISPs with more than one point of presence (PoP) may have separate connections to an upstream ISP at multiple PoPs, or they may be customers of multiple upstream ISPs and may have connections to each one of them at one or more point of presence. Transit ISPs provide large amounts of bandwidth for connecting hosting ISPs and access ISPs. A virtual ISP (VISP) is an operation that purchases services from another ISP, sometimes called a wholesale ISP in this context, which allow the VISP's customers to access the Internet using services and infrastructure owned and operated by the wholesale ISP. VISPs resemble mobile virtual network operators and competitive local exchange carriers for voice communications. Free ISPs are Internet service providers that provide service free of charge. Many free ISPs display advertisements while the user is connected; like commercial television, in a sense they are selling the user's attention to the advertiser. Other free ISPs, sometimes called freenets, are run on a nonprofit basis, usually with volunteer staff. A wireless Internet service provider (WISP) is an Internet service provider with a network based on wireless networking. Technology may include commonplace Wi-Fi wireless mesh networking, or proprietary equipment designed to operate over open 900 MHz, 2.4 GHz, 4.9, 5.2, 5.4, 5.7, and 5.8 GHz bands or licensed frequencies such as 2.5 GHz (EBS/BRS), 3.65 GHz (NN) and in the UHF band (including the MMDS frequency band) and LMDS. ISPs may engage in peering, where multiple ISPs interconnect at peering points or Internet exchange points (IXs), allowing routing of data between each network, without charging one another for the data transmitted—data that would otherwise have passed through a third upstream ISP, incurring charges from the upstream ISP. 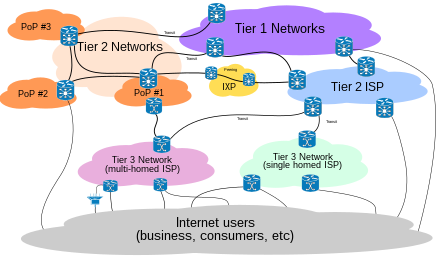 ISPs requiring no upstream and having only customers (end customers or peer ISPs) are called Tier 1 ISPs. Network hardware, software and specifications, as well as the expertise of network management personnel are important in ensuring that data follows the most efficient route, and upstream connections work reliably. A tradeoff between cost and efficiency is possible. Internet service providers in many countries are legally required (e.g., via Communications Assistance for Law Enforcement Act (CALEA) in the U.S.) to allow law enforcement agencies to monitor some or all of the information transmitted by the ISP, or even store the browsing history of users to allow government access if needed (e.g. via the Investigatory Powers Act 2016 in the United Kingdom). Furthermore, in some countries ISPs are subject to monitoring by intelligence agencies. In the U.S., a controversial National Security Agency program known as PRISM provides for broad monitoring of Internet users traffic and has raised concerns about potential violation of the privacy protections in the Fourth Amendment to the United States Constitution. Modern ISPs integrate a wide array of surveillance and packet sniffing equipment into their networks, which then feeds the data to law-enforcement/intelligence networks (such as DCSNet in the United States, or SORM in Russia) allowing monitoring of Internet traffic in real time. ^ Outreach: The Internet, U.S. National Science Foundation, "In March 1991, the NSFNET acceptable use policy was altered to allow commercial traffic." ^ "Web history timeline". 2014-03-11. Retrieved 21 September 2015. ^ Clarke, Roger. "Origins and Nature of the Internet in Australia". Retrieved 21 January 2014. ^ Wyatt, Edward (23 April 2014). "F.C.C., in 'Net Neutrality' Turnaround, Plans to Allow Fast Lane". The New York Times. Retrieved 23 April 2014. ^ Staff (24 April 2014). "Creating a Two-Speed Internet". The New York Times. Retrieved 25 April 2014. ^ Carr, David (11 May 2014). "Warnings Along F.C.C. 's Fast Lane". The New York Times. Retrieved 11 May 2014. ^ Crawford, Susan (28 April 2014). "The Wire Next Time". The New York Times. Retrieved 28 April 2014. ^ Staff (15 May 2014). "Searching for Fairness on the Internet". The New York Times. Retrieved 15 May 2014. ^ Wyatt, Edward (15 May 2014). "F.C.C. Backs Opening Net Rules for Debate". The New York Times. Retrieved 15 May 2014. ^ Wyatt, Edward (10 November 2014). "Obama Asks F.C.C. to Adopt Tough Net Neutrality Rules". The New York Times. Retrieved 15 November 2014. ^ NYT Editorial Board (14 November 2014). "Why the F.C.C. Should Heed President Obama on Internet Regulation". The New York Times. Retrieved 15 November 2014. ^ Sepulveda, Ambassador Daniel A. (21 January 2015). "The World Is Watching Our Net Neutrality Debate, So Let's Get It Right". Wired. Retrieved 20 January 2015. ^ Weisman, Jonathan (19 January 2015). "Shifting Politics of Net Neutrality Debate Ahead of F.C.C.Vote". The New York Times. Retrieved 20 January 2015. ^ Staff (16 January 2015). "H. R. _ 114th Congress, 1st Session [Discussion Draft] - To amend the Communications Act of 1934 to ensure Internet openness..." (PDF). U.S. Congress. Retrieved 20 January 2015. ^ Lohr, Steve (2 February 2015). "In Net Neutrality Push, F.C.C. Is Expected to Propose Regulating Internet Service as a Utility". The New York Times. Retrieved 2 February 2015. ^ Lohr, Steve (2 February 2015). "F.C.C. Chief Wants to Override State Laws Curbing Community Net Services". The New York Times. Retrieved 2 February 2015. ^ Flaherty, Anne (31 January 2015). "Just whose Internet is it? New federal rules may answer that". AP News. Retrieved 31 January 2015. ^ Fung, Brian (2 January 2015). "Get ready: The FCC says it will vote on net neutrality in February". The Washington Post. Retrieved 2 January 2015. ^ Staff (2 January 2015). "FCC to vote next month on net neutrality rules". AP News. Retrieved 2 January 2015. ^ Lohr, Steve (4 February 2015). "F.C.C. Plans Strong Hand to Regulate the Internet". The New York Times. Retrieved 5 February 2015. ^ Wheeler, Tom (4 February 2015). "FCC Chairman Tom Wheeler: This Is How We Will Ensure Net Neutrality". Wired. Retrieved 5 February 2015. ^ The Editorial Board (6 February 2015). "Courage and Good Sense at the F.C.C. - Net Neutrality's Wise New Rules". The New York Times. Retrieved 6 February 2015. ^ Weisman, Jonathan (24 February 2015). "As Republicans Concede, F.C.C. Is Expected to Enforce Net Neutrality". The New York Times. Retrieved 24 February 2015. ^ Lohr, Steve (25 February 2015). "The Push for Net Neutrality Arose From Lack of Choice". The New York Times. Retrieved 25 February 2015. ^ Staff (26 February 2015). "FCC Adopts Strong, Sustainable Rules To Protect The Open Internet" (PDF). Federal Communications Commission. Retrieved 26 February 2015. ^ Ruiz, Rebecca R.; Lohr, Steve (26 February 2015). "In Net Neutrality Victory, F.C.C. Classifies Broadband Internet Service as a Public Utility". The New York Times. Retrieved 26 February 2015. ^ Flaherty, Anne (25 February 2015). "FACT CHECK: Talking heads skew 'net neutrality' debate". AP News. Retrieved 26 February 2015. ^ Liebelson, Dana (26 February 2015). "Net Neutrality Prevails In Historic FCC Vote". The Huffington Post. Retrieved 27 February 2015. ^ Ruiz, Rebecca R. (12 March 2015). "F.C.C. Sets Net Neutrality Rules". The New York Times. Retrieved 13 March 2015. ^ Sommer, Jeff (12 March 2015). "What the Net Neutrality Rules Say". The New York Times. Retrieved 13 March 2015. ^ FCC Staff (12 March 2015). "Federal Communications Commission - FCC 15-24 - In the Matter of Protecting and Promoting the Open Internet - GN Docket No. 14-28 - Report and Order on Remand, Declaratory Ruling, and Order" (PDF). Federal Communications Commission. Retrieved 13 March 2015. ^ Reisinger, Don (13 April 2015). "Net neutrality rules get published -- let the lawsuits begin". CNET. Retrieved 13 April 2015. ^ Federal Communications Commission (13 April 2015). "Protecting and Promoting the Open Internet - A Rule by the Federal Communications Commission on 04/13/2015". Federal Register. Retrieved 13 April 2015. ^ "Open Internet - FCC.gov". fcc.gov. Federal Communications Commission. 2017-06-12. ^ The Editorial Board (29 April 2017). "F.C.C. Invokes Internet Freedom While Trying to Kill It". The New York Times. Retrieved 29 April 2017. ^ Reardon, Marguerite (2 May 2017). "Net neutrality redux: The battle for an open net continues – The Republican-led FCC is starting to roll back net neutrality rules. Here's what you need to know". CNET. Retrieved 2 May 2017. ^ Fung, Brian (21 November 2017). "FCC plan would give Internet providers power to choose the sites customers see and use". The Washington Post. Retrieved 21 November 2017. ^ Collins, Keith (11 June 2018). "The Net Neutrality Repeal Is Official". The New York Times. ^ "What are the different Internet connection methods?". Archived from the original on October 13, 2009. ^ "FTTx: Fiber To The Home/Premises/Curb". The Fiber Optic Association. Retrieved June 1, 2013. ^ "CCNA". ciscoccna24.blogspot.com. Retrieved 2 February 2015. ^ J.D. Falk, ed. (November 2011). Complaint Feedback Loop Operational Recommendations. IETF. doi:10.17487/RFC6449. RFC 6449. Retrieved 28 June 2012. ^ Murray Kucherawy, ed. (June 2012). Creation and Use of Email Feedback Reports: An Applicability Statement for the Abuse Reporting Format (ARF). IETF. doi:10.17487/RFC6650. RFC 6650. Retrieved 28 June 2012. "Mailbox Provider" refers to an organization that accepts, stores, and offers access to RFC 5322 messages ("email messages") for end users. Such an organization has typically implemented SMTP RFC 5321 and might provide access to messages through IMAP RFC 3501, the Post Office Protocol (POP) RFC 1939, a proprietary interface designed for HTTP RFC 7230, or a proprietary protocol. ^ Amazing.com "Hooking up to the Internet"
^ NSA PRISM Creates Stir, But Appears Legal. InformationWeek. Retrieved on 2014-03-12. ^ "Obama's Speech on N.S.A. Phone Surveillance". The New York Times. 17 January 2014. Retrieved 21 January 2014. ^ "New KGB Takes Internet by SORM". Mother Jones. Retrieved 2 February 2015. This page was last edited on 24 April 2019, at 15:12 (UTC).